Clubhouse with changing rooms, bar, restaurant. Pro shop with club and trolley hire along with practice facilities on site. Tennis, swimming pool and horse riding also available. 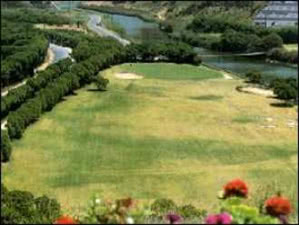 This 9 hole course is attached to the Hotel Golf Mar and is part of their facilities. The River Alcabrichel runs along one side of the course and this brings misfortunate to players with a tendency to make wayward shots. Although, the course is not long in length its holes present some difficulty due to the need for accuracy and the distances involved. A good example is the 9th hole of 191 meters and a par-3. Due to the elevated position of the green it presents a very interesting challenge to the average player and also a demanding a well executed shot from even an experienced golfer.